The Leveraged Finance market continues to act as a "canary in the coal mine" with respect to the overall economy. It represents the most vulnerable companies and investors with the highest risk appetite. That is why it is often helpful to look at high yield bond issuance. As we saw earlier, that market came to a stop in Europe in the second half of 2011. 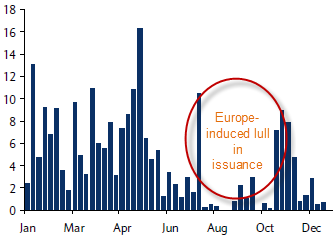 That also initially happened in the US, but in contrast to Europe, the issuance picked up again in November. It is also helpful to track the use of proceeds from high yield bond issuance. It says a great deal about levels of risk appetite in the economy and how leverage is being used. 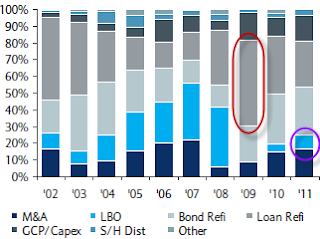 For example in 2009 companies were faced with a wall of maturing loans originated during the heyday of LBO activity. It was a race against time as firms rushed to issue HY bonds to refinance these loans. That refinancing shows up in the use of proceeds as "Loan Refi" in the chart above for 2009 (red oval). Companies were in fact able to address this maturity issue resulting in low default rates. In 2011 (in addition to strong refinancing activity) we saw higher LBO activity, showing increasing risk appetite. But unlike the pre-crisis years, M&A levels exceeded LBO activities (for reasons discussed here). 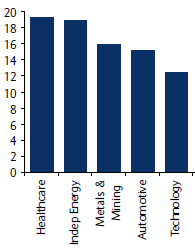 Healthcare dominated HY issuance in 2011, being one of the more "defensive" sectors. Resource companies also sold a great deal of debt. The high yield market will be one of the key early indicators to watch this year for potential signs of unexpected economic weakness.